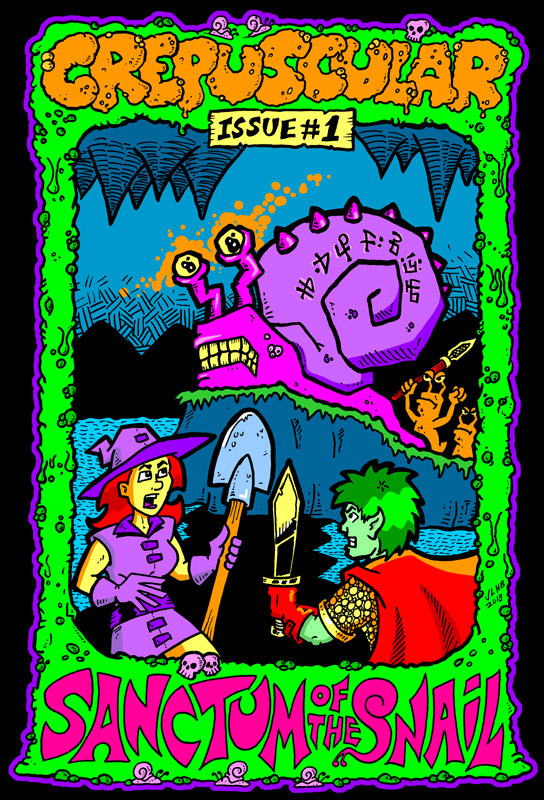 Just before it was released, I had the chance to playtest The Sanctum of the Snail, a DCC adventure by Josh Burnett from the Bernie the Flumph! blog. The following play report is partially narrated by my lone surviving character, Little Matchstick Greta, the guild beggar. For reasons that will become clear, halfway through the adventure she became incredibly whiny. In my head, she sounds just like the character "Flip" from Connie Willis' novel Bellwether. Sadly, none of us played as Starfire or Captain Planet. "It wasn't MY fault we got in a shipwreck! The captain was supposed take us all the way to the CITY, not crash us into some ISLAND!" A group of travelers had all booked passage on the good ship Starfish to seek a new life in the distant city of Xothma-Ghul. They almost made it too, but shipwrecked on a tiny island only a day away from their destination. My characters were Greta, Princess Persimmon the noble, Sally Sneakers the cobbler, and Spanakopita the halfling mariner. Todd started out with Lisk the tailor, Raymundo the herbalist, Orvis the dwarven herder (and his sow Marie), and Tammy the hunter. Gilbert and Doyce had Kyle the dwarven stonemason, Mournath the dwarven blacksmith, Brian the wizard's apprentice, Geof the woodcutter, Bob the mercenary, Jack the ropemaker, Phil the other mercenary, and Norman the baker. "Anyway, it was the sharkboys who attacked US! We weren't even DOING anything!" The travelers got washed ashore amidst a raging storm to find the captain laying dead on the rocks before them, and a gang of 8 hillbilly sharkboys clambering up onto the island to attack them. They saw the sinking remains of the Starfish to one side, and a stone door cut into the rock of the island to the other. The dwarven brothers Kyle and Mournath were the MVPs of this combat, and frankly, of the entire session. ("No! It was me! I'm the most valuable EVERYTHING!") They recovered the captain's iron khopesh sword, used it to kill one of the sharks, pushed open the heavy stone door, defended it until everyone was inside, and then got it closed again. Meanwhile, Raymundo, Tammy, Geof, Bob, and Norman got torn to shreds with nothing to show for it. Greta, Princess Persimmon, Sally, Spanikopita, Brian, Jack, and Phil only survived because they ran for it. Lisk killed one sharkboy with his scissors, then got eaten too. Orvis only survived because he threw his beloved sow Marie to the sharks, who ate her instead of chasing him. The sharkboys did a fair bit of bumbling too. The rolled at least 3 fumbles, resulting in a sharkboy tripping over his own tail and faceplanting, another breaking his teeth biting the rocks, and a third pratfalling by tripping over a sharkboy corpse. "I didn't even WANT to go in that old door! I wanted to go back to the SHIP! It was those dwarf brothers who MADE us do down there! It was THEIR idea!" Spanakopita realized the tide was coming in and that the whole island was going to submerge when it did. Fortunately, the stonemasonry on the door was excellent, and it fit so well no water leaked in. Kyle used a rope and a flask of oil to make a lantern, and Mournath used a second rope to create a handhold as the group descended a giant staircase that simply sheered off like a cliff to either side. Some ways down the stairs, but not yet at the bottom, they encountered a partially collapsed bridge lit by candles, and a golden door that seemed to glow in the candle-light on the far side. Really all that remained of the bridge were two support pillars. Orvis leapt across the gap to the first pillar, and it immediately began crumbling beneath his feet. He leapt to the second, and then across to the far side, but the others were now trapped with the gap between them too far to jump over. While the others waited, Orvis found the skeleton of a dead elf on the landing and immediately began rifling through its supplies. He found a 20' length of copper chain, a heavy basket, and empty barrel, a rusty wheelbarrow, a lead statue of a duck, several iron spikes, and a flask of oil. Ropemaker Jack managed to toss one end of a length of rope to Orvis, and they each hammered down their sides with iron spikes. Princess Persimmon tried crossing this makeshift rope-bridge first, and attempted to show off by walking across it like a slack-line. Halfway across, she fell off and plummeted to her death. ("I didn't tell her to walk like that! She said it was SAFER that way!") One at a time, the others started shimmying across the chasm by hanging upside down on the rope. At one point, their end gave way, but Mournath caught it, and stayed until last to hold the rope for the others, before swinging across the chasm and climbing up to the landing in the end. The whole affair took on a sense of urgency when a swarm of tiny, but carnivorous snails crawled up the landing and ate Orvis, rapidly reducing him to a skeleton. The others heaped some gear into the wheelbarrow and rushed through the golden door. Mournath took another glance at the elf, and realized the skeleton was wearing human-skin leather armor and carrying a steel-hard glass sword. He declined to collect the armor, but did take the glass sword, along with a handful of ancient moon-shaped coins. "I was the one who got Blorgamorg to listen to us! The others don't even know HOW to beg properly! Begging is my JOB, so of COURSE I'm good at it!" Through the golden door, the group arrived in a huge natural cavern, lit by growths of glowing amber stone. There was a giant altar in the center of the room, and a slime-coated tunnel on the far side leading out. A shadow filled the room as a giant snail with gemstone eyes slithered down from the ceiling. In a booming voice, it declared "Hello little ones, Blorgamorg has use for you!" Brian dropped to his knees and began groveling, Phil nonchalantly backed away, and Spanakopita ran to the edge of the cave in a panic. 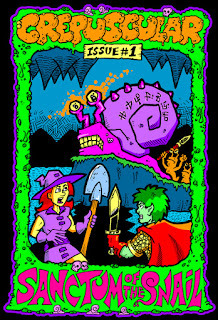 Greta politely beseeched Blorgamorg for help, and the great snail explained that his own former apprentice had returned to the island and built an accursed sanctum further below. He wanted the travelers to force out the wizard, and Greta agreed on behalf of the group. The snail patron offered them extra help, in the form of four more shipwreck survivors, who were spit out of the floor by a wave. These were Todd's replacement characters, Schitts the blacksmith, Chase the halfling moneylender, Dennis the weaver, and Dodge the caravan guard. Jack investigated the slime-coated tunnel and saw that it was actually a chute dropping almost straight downward. Spanakopita climbed into the wheelbarrow with the gear and told the others to give it a push. The barrow raced down the greasy shaft and came to an immediate halt when the front wheel got snapped into a bear trap. Spanakopita went flying, landed face-first on some rocks, and died. Mournath went next, avoided getting speared on the wheelbarrow handle, and then called down to the others that it was safe to descend. "I knew the wheelbarrow wasn't safe, but Spanakopita wouldn't LISTEN to me! I didn't even get a chance to SAY anything before she died! Anyway, this is where I found the wonderful medallion that made everything make SENSE for a change. The others say the amulet CHANGED me, but they're just JEALOUS because I found the BEST treasure ever!" At the bottom of the chute, the travelers found themselves on a beach at the foot of the stairs. The water to either side of the staircase faintly glowed, and there were two burning braziers flanking a door directly across from the foot of the stairs. They saw a large, turtle-like creature washed up on the shore. Sally went to investigate, with Schitts following close behind. As she got close, a tapeworm leapt from the turtle's flank and dove down Sally's throat, desiccating her and killing her instantly. Seven more worms danced like cobras from the side of the turtle, so Schitts backed away. Greta helped herself to some of Sally's and Spanakopita's supplies. The group saw two statues on either side of the staircase, one a statue of a man, the other a statue of a lion, both wearing medallions. Brian the wizard's apprentice recognized the man as a god of chaos and the lion as a god of laws and kings. Persimmon's body floated near the statue of the man. Greta waded out to the statue of the man and circled it, seeing that he held a dagger hidden behind his back, then took the medallion. She realized immediately that all her problems were somebody else's fault, and everyone else in the group was to blame for her current situation. ("See? It's like I TOLD you! The medallion knows! Why can't you ever LISTEN to me?") Dodge waded out to the statue of the lion and took its medallion, but then Chase took it from him and put it on. He immediately felt incredibly guilty for stealing from his friend. Meanwhile Kyle and Mournath freed the wheelbarrow and collected the bear trap. "I want to be rewarded! I DESERVE a reward!" The travelers passed through the door at the foot of the stairs and arrived in a rough stone chamber, with a stone dodecahedron hanging from the ceiling, swaying slightly in the breeze. Immediately under the dodecahedron was a stone altar with a white ceramic pitcher, with writing that promised "Drink if you would be rewarded for patient consideration." Kyle and Mournath assumed the hanging stone would fall and crush anyone approaching the pitcher, but Greta, Brian, Dennis, and Dodge all drank water from the pitcher. As he drank, Brian studied the geometric stone overhead, and realized that the runes carved into it were names of gods of balance. The continued into a damp-smelling room full of glowing, twitching human-sized green ovals. Each oval was connected by a strand of slime to a central nodule, which sat atop a tall stone pillar. Schitts wriggled up the pillar and saw a dark sphere inside the green nodule. Using his blacksmithing tongs, be pulled the sphere out. As he removed it, the ovular shapes dimmed and went still. Schitts recognized that whatever this metal was, it was heavier than lead, and was carved into the shape of an eyeball with a gemstone iris. The wanderers were eager to leave that room, but the next one they entered had a giant stone coffin, and the walls were indented with niches, where skeletons stood guard. They backed out, and found a staircase going deeper into the island sanctum. Schitts started leading the group down a hall at the bottom of the stairs, but the floor collapsed under him, and under brave Brian, who had rushed forward to try to save him. ("I wanted to save him, too! Brian pushed me out of the way! He didn't even LET me try to help!") They fell 30 feet into shallow water and both died on impact. The makeshift lantern Brian had been carrying lit the scene of carnage at the bottom of the pit. ("Plus Brian broke our lamp! What are we going to DO without a lamp, Brian?") Inspecting through the open trapdoor, they saw a third body - the skeleton of a dwarf holding a metal box. Kyle and Mournath used a chain to lower Chase down to the water. He retrieved the lockbox and was pulled back up. Mournath broke the rusted box open with his hammer and found dozens of silver coins, and a lead coin good for a free drink at one of the bars in Xothma-Ghul. The group edged their way around the trap door, and took another staircase at the end of the hall. "If you look at it from their perspective ... then we're the ones in the wrong ... which means I'm wrong ... which means their perspective is STUPID! We should KILL them for being stupid!" The travelers entered a slime-coated chamber where they walked in on a half-dozen slug-men eating fungus from a clay pot. The monsters dropped their mean and hastily started gathering their spears. Greta, Dennis, and Dodge found themselves afflicted with the Curse of Thoughtful Deliberation, which tempted them to consider the situation from the slug creatures' point of view. In practice, this went more like them considering considering the slug-men's point of view, then deciding to kill them anyway. Kyle and Mournath once again did most of the killing, and afterward, everyone took a shield, spear, and copper chaos-symbol necklace from the dead soldiers. The group also inspected the clay pot, which was full of colorful mushrooms. Chase ate one, his eyes turned red, and he became able to see in the dark. Greta was jealous of Chase, ("I was NOT! Chase was jealous of ME!") ate a mushroom, and experienced the same effect. Dennis ate a mushroom that tasted foul, and caused four small mushrooms to grow out of the top of his head. He wasn't very happy with that result, so he ate another. The mushrooms on his head turned black and withered, and he began uncontrollably vomiting green sludge until he died. ("Dennis was jealous TOO! See! EVERYONE'S jealous of me!") The clay pot went into the wheelbarrow with the rest of their treasure, and the group moved on. Entering another hall, the group found a very new-looking wooden door, along with another set of stairs leader further down. Greta peeked through the keyhole and saw a bedroom lit by candlelight. Using the dagger she stole from Spanakopita, ("I didn't steal it! Spanakopita GAVE it to me! After she died!") Greta managed to pick the lock, and the door opened silently. The air in the bedroom was clammy and damp. It was well-appointed, with fine bedsheets, tapestries hung from the walls, and a large wardrobe to match the four-poster bed. The group concluded that this must be the wayward apprentice's room. Greta opened the wardrobe and stole several fancy silk robes and bottles of perfume. ("I DIDN'T steal them! The apprentice GAVE them to me! She WANTED me to take them!") Chase found a lockbox and tried out Greta's lockpicking trick, and managed to prise it open. He found rubies, a clay vial with a potion, and a receipt for some paintings Xothma-Ghul's favorite artist, Spargo Excellerando. Mournath, Kyle, and Dodge searched the room for hidden exits, checking behind every tapestry, and eventually found a door mechanism in the wardrobe. The room on the far side of the wardrobe was lit by a silver candelabra. This was a smaller, more utilitarian space, with a purple book on a small wooden table. Chase started flipping through the book, and as he did, a black crayfish with glowing purple runes emerged from the book's shadow and began attacking him. Mournath and Kyle assailed it with spears ("THEY'RE the ones who stole those spears from the slug-men! THEY'RE the thieves!") and Greta heroically saved the day by shutting the book and tossing it into the wheelbarrow, along with the silver candelabra. The group agreed their next move should be down the stairs to confront the apprentice. "I killed a demon, all Todd's characters got killed again, and the slug-men wouldn't LISTEN to me! You NEVER listen to me!" At the bottom of the stairs, the travelers entered a room filled waist-deep with brackish water. They saw another stone altar, this one glowing with red runes, and just visible at the far side of the room was a doorway out, with fresh breeze blowing in. After Blorgamorg's entrance, Kyle and Mournath immediately looked up at the ceiling, where they saw a woman with the lower body of a slug, clining to the ceiling and wielding a multi-colored sword. They immediately assailed her with spears. She quickly lost blood from her injuries, then passed out unconscious, falling into the water below, where she was speared to death. Searching the fallen apprentice's body, Kyle recovered her multi-hued metal sword, and Mournath found some jewelry which he put in the wheelbarrow. They floated the barrow across the flooded room and through the door on the far side. They found three paintings leaning against the wall. One had been burnt badly, and another showed a sunny field before a distant village. Mournath touched the painting, and both he and the wheelbarrow disappeared, magically transported to the outskirts of Xothma-Ghul, a location almost identical to the painting. Kyle, feeling worried for his brother, touched the painting and disappeared as well. Greta felt worried about the treasure ("They're trying to STEAL from me! EVERYONE'S always stealing from me!") and followed close behind. It feels right to me that one guy left early, one guy burned through 8 zero-levels with nothing to show for it, one guy got two unstoppable dwarven killing machines armed with an unbreakable elf-glass rapier and an iridescent anodized titanium longsword ... and I got a thief with a cursed necklace. OMG, thanks for this write-up, Anne! I love Greta's inner dialog running commentary. You either took copious notes or have an incredible memory. Either way, I'm impressed! I'm glad you like it! I take notes. I have a good memory ... but not THAT good. Anne another great write up! Thanks for bringing back memories of that fun evening! 8 Abilities - 6, 3, or 4 Ability Scores? I2TO - Never Tell Me the Odds!